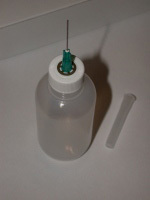 Polyethelene glue bottle with a blunt needle applicator (glue not included). It allows you to place glue exactly where you want it and dispense it quickly. You can fill it with your favorite solvent based glue, such as Tenax or Plastruct Weld Bond.